Today I’m going to be talking about the Monroe piercing, also known as the Crawford or Madonna piercing. The Monroe Piercing is done off center of the upper lip. 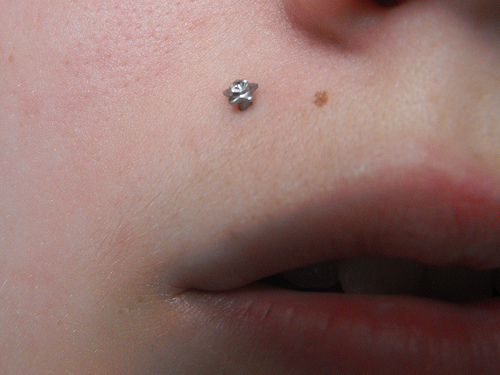 Monroe piercings are done in the same place where a number of stars have beauty marks (moles). Hence this type of body piercing is known after these famous personalities. The most common jewelry for this piercing would be a labret stud. Normally pierced at a 16 gauge but can be done anywhere from a 16 to a 12 gauge. Jewelry for this piercing should be made of titanium or implant grade/surgical grade stainless steel. Titanium is a lightweight metal that is ideal for people with concerns about nickel sensitivity. This material can be anodized to create jewelry of different colors without affecting the safety. Look for implant certified titanium (Ti6Al4V ELI) that is ASTM F-136 compliant or ISO 5832-3 compliant, or commercially pure titanium that is ASTM F-67 compliant. We sell titanium jewelry for this piercing. Jewelry should be internally threaded, this means the end ball threads or press fits into the post. You should never be pierced with externally threaded jewelry, this type of jewelry is cheap, usually made with nickel, and many people have allergic reactions to it. Jewelry not made of surgical stainless steel and externally threaded can cause micro tears in the tissue, the external threads can harbor bacteria that may lead to infection. We also pierce with a longer post to avoid complications with swelling, this longer length will need to be down sized after initial healing has taken place. There are some risks with oral piercings and you should be aware of the dangers before you decide if this piercing is right for you. Contrary to what you might think, infection is not the most common risk from oral piercings. The human mouth has a lymphatic system, mucus membranes, and saliva that provide defenses to infection. The biggest danger is damage to teeth, gums, and oral structures from jewelry. So if you have a history of bad teeth or gum problems this piercing may not be advisable. The enamel on your teeth can get cracked or chipped if you constantly play with your jewelry or accidentally bite on it. Continuous pressure from the jewelry against gums and teeth can also become a problem. If the jewelry is to long, or improperly placed, it can cause your gums to recede. Enamel, bone, and gum tissue do not regenerate. You can reduce these risks by wearing the right size jewelry (downsize) and avoid playing with this piercing. Dissolve 1/4 teaspoon of non-iodized (iodine-free) sea salt into one cup (8 oz.) of warm distilled or bottled water, soak for five to ten minutes two to three times per day. Dry by gently patting with clean, disposable paper products. Cloth towels can harbor bacteria and snag on jewelry, causing injury. The Monroe is a very cute piercing if you’re looking for something new. Keep in mind this may not be the best piercing for anyone who has gum or teeth problems and it is important to downsize. If you have any further questions feel free to call or stop by to talk with any of our piercers.